In our eagerness to spread the blame for our country’s economic slowdown, perhaps we have looked past a vital link in the chain of sound practice when it comes to money: the home. Rather than find scapegoats for the unemployment rate, the slowness of job creation and the paralyzed housing market, maybe the best response we could have is to teach your children, self reliance themes, by teaching them about finance and investing so that they will not repeat the same mistakes as our generation. In poll after poll, parents come up woefully short in their efforts in teaching children responsibility about finance and investing. Parents often put a premium on educating their children about manners, self-reliance themes, honesty, integrity, drugs and alcohol, healthy eating, the importance of getting good grades, etc., but say little to nothing about money. Surveys show that several of the topics listed above are thought to be more important to teach to children than money, in the opinion of American parents. It’s never too early to begin to share with your children what you have learned about finance and investing. The Commission found that a full 30% of parents rarely or ever talk to their children about money matters. Our national savings rate has slipped below zero, so perhaps the next generation can do better if we educate it about savings. We might need to tell them to do what we say and not what we have done. Even so, if you are going to be teaching children responsibility about investing, you obviously need to cover other topics, such as savings, so that they have something to invest. 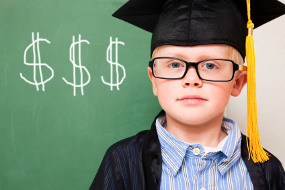 Even at an early age, children can learn about the wisdom of saving money. Books such as The Berenstain Bears’ Dollar and Sense and A Dollar for Penny, among others, can help to communicate to your children the importance of saving from an early age. Once a child begins to earn an allowance or income from a lemonade stand or the like, you can encourage them to save by matching their savings and/or telling them what they will be saving for (items that you will not be paying for), such as a first car or an expensive phone. Once you have your child saving, and maintaining that habit even when they begin to earn more through part-time work, you can then begin to educate them about investing. Those who have been successful in the business world would say that parents have an obligation of teaching children responsibility about investing, even if they are not big players in the market. This education in investing can begin with a simple lesson in reading account statements. It can then pass to explaining how you invest and why, what brokers and investment advisors do, what mutual funds, bonds and stocks are. Two top book recommendations for pre-teens and teens are Money Sense for Kids and The Wealthy Barber. Money that just sits actually erodes about 2-3% due to inflation, so putting one’s money to work is a good idea in most eras. Investing is a long-term project, and one should not expect to pull out the money that is invested in a short span of time. Likewise, money that is needed in the short term of one’s budget should not be thrown into the market. You can help your child make actual investments or simply “paper” investments, something that many high school economics classes do. TradeMonster allows paper trading on its site, using virtual dollars. In either case,build self reliance themes by communicating the value of a diversified portfolio over the search for a “magic stock” that will make them rich. Efforts in teaching children responsibility about finance and investing will not only help them to lead more successful and less stressful lives, it might even save our nation’s economy from ruin.